Water Bath for Vegetables & Fruit – Is it Necessary? If you grow vegetables in your garden, it’s probably second nature to give them a wash when you bring them inside. After all, they are growing in the dirt and those that grow on vines often have dust and other particles on them. But what about the fruit and veggies that you purchase in a store. Should these be washed? According to the FDA, fruits and vegetables should be washed under running water just before eating, cutting, or cooking them. Colorado State University also states that fresh produce can harbor bacteria, fungi, and other microbes along with trace amounts of chemicals. So, it seems to make sense to at least give the veggies a rinse under water even if they look clean before consuming them to be safe. I’ve seen recommendations for also using either vinegar or food grade hydrogen peroxide in a water bath to clean veggies and fruit of any unsafe residue. Both of these are non toxic, so are safe to use with foods. Combine 3 parts water to 1 part white (or apple cider) vinegar in a spray bottle. Spray this on fruits and veggies. Since both vinegar and hydrogen peroxide are known to be good general cleaners, it makes sense to me to add a bit to the water if you are going to wash them anyway. It certainly can’t hurt and may just help to kill more bacteria than normal washing will. What do you think? Do you wash your vegetables before eating? Please leave your comments below. 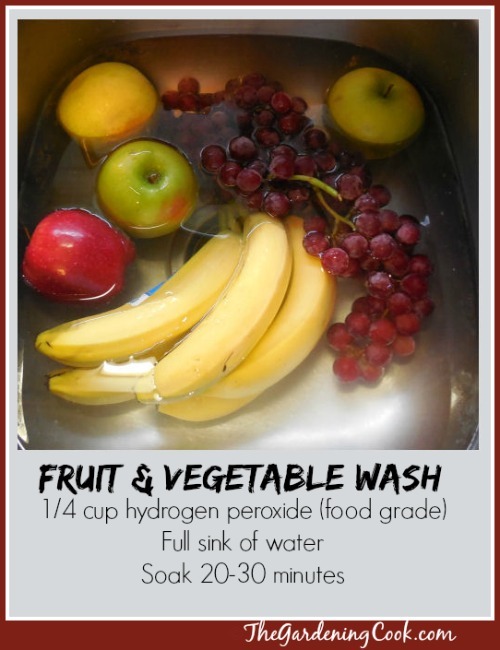 I do use peroxide to soak my veggies & fruit…but why do i have to rinse them afterwards? This was very helpful; thanks so much for sharing!